Bill Martin Jr (1916 - 2004) was the beloved author of more than 300 books for children including favorite classics such as Chicka Chicka Boom Boom; Brown Bear, Brown Bear, What Do You See? ; and Polar Bear, Polar Bear, What Do You Hear? Visit the Bill Martin Jr Library on the campus of Texas A&M University--Commerce. Dr. Michael Sampson taught kindergarten through sixth grade before meeting fellow literacy expert, Bill Martin Jr. They established a lifelong friendship and collaborated on countless bestselling books for children, including Chicka, Chicka, 1...2...3 and Panda Bear, Panda Bear, What Do You Hear? Dr. Sampson speaks at schools, book festivals, and conferences, where he is known for his high energy, entertaining performances. He is currently Dean of the School of Education at St. Johns University in New York City and lives with his family on Long Island. You can visit both Bill Martin Jr and Michael Sampson at: www.billmartinjr.com. 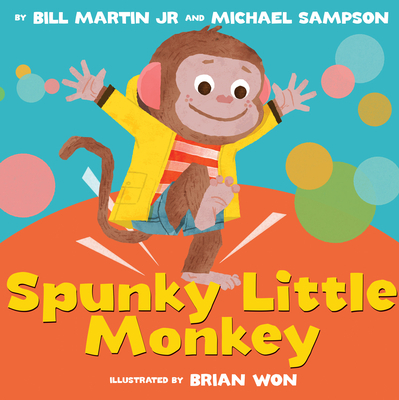 Brian Won was inspired by his own spunky little monkey while illustrating the pictures for this book. He is the co-founder of National Television, a design and animation company. His debut picture book, Hooray for Hat!, was a Childrens Choice Award Finalist and was awarded a Silver Medal from the Society of Illustrators. A Chicago native, Brian currently lives in Southern California with his wife and their son. You can visit him at www.brianwon.com.